Plan ahead: For all events that require tech support, we ask that you give us at least 5 business days notice. This deadline ensures that we have enough time to coordinate support with other departments (that have similar deadlines) and ensures that we can support more events and produce higher quality events. Give the Master Location Schedule a spin: This tool can help you get a list of spaces that have the features you need: visit go/mls, open the Locations tab, click More Search Options and under Features select the feature you are looking for (e.g. Computer installed at the podium). This can be very helpful in the early planning stages. Not all spaces are well suited for the above purposes (due to acoustics, lighting, capacity, etc.) Thus, to ensure a successful event, LIS has selected specific locations (see list below) that are best designed for these types of events. The Scheduling Office will work with you and LIS to find the best location for your event. Many event venues already have the most popular equipment (projection, speakers, etc. ), as well as an easy to use control panel and a set of printed instructions. With a brief orientation session, you’ll operate the equipment with ease. Contact the Helpdesk if you would like to schedule an orientation session. If the location you are hoping to use does not have the equipment you need, LIS offers several options for getting equipment on loan. If you’re sure you’ll need tech support, make sure to indicate that when filling out your event reservation request. The Scheduling Office is your ally. Submit your reservation request to the scheduling office as soon as possible, keeping in mind that LIS and other service departments require a 5-7 day notice. If you do require equipment or tech support, please ensure you select the appropriate option on the form. If the correct option is selected, the Scheduling Office will notify the Helpdesk of your event in a timely manner and we will contact you if more information is needed. Again, it is imperative that you respond to our requests for information at least 5 business days in advance of the event. Useful forms: To help you prepare for some types of events, and to ensure we get all the information necessary to give you our best service, we may ask you to complete a simple form. See the list of useful forms below. Guest speakers: If you are bringing a guest speaker on-campus, send them our Technology Checklist for Visiting Speakers. Use a podium computer or bring your own: A lot of classrooms have a built-in computer at the podium, reducing the need to bring your own computer. Again, the Master Location Schedule can help you get a list of these locations. If you prefer to use your own laptop for the presentation, make sure to test your computer and your presentation in the event location. Please feel free to contact the Helpdesk if you would like us to help out with the test! Every year we renovate selected spaces, so the options will continue to grow. You can always check the above links for the most up-to-date information. You will need to have the speaker(s) fill out the recording consent form (go/consent). We need to receive this form 2 business days (48 hours) before the event or we will not be able to record. This is a legal document that ensures the speaker is aware of your intent and, at the same time, protects you and the College in the case of a lawsuit. For more information, visit go/consent. Complete the recording request form (go/recording). We need to receive this form 5 business days before the event or we will not be able to record. This form collects information that we need to prepare for the recording, create a high quality recording that is accessible and reliable, and properly catalog the recording so that you or the College may reuse it in the future. For more information visit go/recording. Complete the screening request form (go/screening). We need to receive this form 5 business days before the event or we cannot guarantee that we can staff the screening. Screening any media requires sufficient time to purchase (or confirm) that we have the screening rights and that we have the working physical media. Even if you plan to bring your own media, screening rights need to be confirmed and the media itself needs to be tested. For more information, visit go/screening. Note: We will continue to update this list, as our services and event venues change. Please check the page Top Tech Tips for a Successful Event for the latest version. In addition, visit the Media Services homepage for more information on our services. This entry was posted in LIS Staff Interest, Middlebury Community Interest, Post for MiddNotes, Post for MiddPoints and tagged Classroom Technology, eNewsletter on September 14, 2012 by Petar Mitrevski. Welcome (back) (new) faculty and students! Sunday’s convocation marked the beginning of the new academic year, and on Monday began the first classes for our over 600 new students and over 30 new faculty. With the rush of settling in now complete, I want to welcome our newest members of the Middlebury community, and at the same time, remind returning faculty and students of key guides to the major resources LIS makes available for our academic community. One obvious place to start, for both faculty and students, is the Ten things students should know page, which describes the top services for students (labs, wireless, reference services, etc.) From this page, you can find links to the key resources that will allow you to make the most of the network and the library. Both new and veteran faculty might also do well to review the page LIS4Faculty which describes many of the same resources, but from the perspective of a faculty member. And for those who want to help shape our agenda for the year, we have two main advisory groups: the Student LIS Advisory Group and the Faculty LIS Advisory Group. These groups provide critical perspective for us as we navigate the complexities of bringing new technology and new forms of information to a campus already bursting at the seams with technology and information. I wish you all the best as you begin your semester. If you have any questions, concerns, ideas, or thoughts about any and all things having to do with LIS, please feel free to contact me. I’m reachable via mdroy@middlebury.edu . This entry was posted in LIS Staff Interest and tagged eNewsletter, welcome on September 14, 2012 by Michael Roy. This entry was posted in LIS Staff Interest and tagged eNewsletter, lis web team, lis website, lynda.com, marketing, QR codes on November 17, 2011 by Barbara Merz. In collaboration with Vergennes boat builder Douglas Brooks, Special Collections is offering a new short-term exhibit The Two Pointers of Dead Creek : A Tradition of Trapping and Boat Building in Addison County. Assistant Curator Danielle Rougeau is working with Douglas Brooks on mounting the exhibit on the Lower Level of the Davis Family Library. The exhibit officially opens on Wednesday, September 1, 2010, and will be on view through Friday, October 1. During the 2009-2010 academic year, Brooks and three Middlebury College students, Renee Igo ’11, Christian Woodard ’11 and Ben Meader ‘10.5, interviewed trappers and their descendants in an effort to document the culture of muskrat trapping in Addison County, with an emphasis on the “two pointers”, the double-ended boats that trappers built. After a training program with the Vermont Folklife Center, the researchers began recording interviews and examining historic boats. Over twenty historic trapping boats were identified in the region. Eventually several boats were carefully measured and one was chosen for replication. The students displayed an historic boat at the 2010 Middlebury College Student Research Symposium. 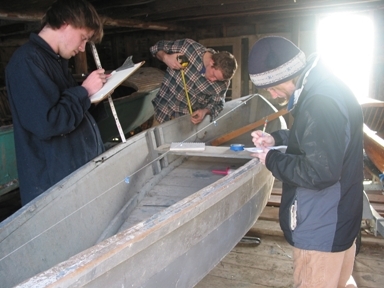 In the 2010 spring semester, Igo, Woodard, and Meader, guided by Brooks, built this trapping boat in studio space at Middlebury’s Old Stone Mill. 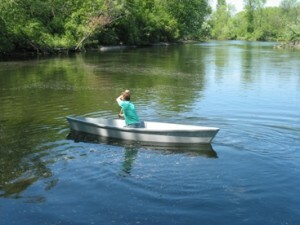 The boat was launched on Commencement day, May 27, 2010. This entry was posted in LIS Staff Interest and tagged Areas and Workgroups, eNewsletter, exhibits, Library Spotlight, Middlebury, Special Collections, students on August 23, 2010 by Andrew Wentink. Our evaluation of Google Apps for Higher Education continues. In preparation for a campus-wide conversation this fall, we are doing in-depth comparison of Google Apps with Microsoft Exchange 2010. This work will culminate in a set of public presentations in late August and early September, which in turn will be the materials we use for the campus-wide conversation. The comparison between Google Apps and Microsoft Exchange is organized into the following ten topics. In the chart below, you will find the topic, a link to the draft outline of the presentation, and the date, time, and place for each presentation. The outlines are available on the Google Apps Evaluation blog, where we are also posting additional readings and thoughts. We encourage you to make comments and suggestions on them in order that the comparison be as complete as possible. In addition, we will post a written version of the presentation a week in advance of the presentation in order to allow for questions and comments from those who can not attend the presentation, and in order to allow the time at the presentation to focus on discussion. This entry was posted in LIS Staff Interest and tagged eNewsletter, Google Apps, LIS Administration on July 14, 2010 by Michael Roy. Since moving in to the Davis Family Library six years ago, we who keep track of print periodicals have received some good news and some bad news. The good news: print periodicals get used a lot more in this Library than they did in our previous building. The bad news: print periodicals get used a lot more in this Library than they did in our previous building. This entry was posted in LIS Staff Interest and tagged eNewsletter, Library Spotlight, magazines, periodicals on July 12, 2010 by Arabella Holzapfel. An annual disclosure to students describing copyright law and campus policies related to violating copyright law. A plan to “effectively combat the unauthorized distribution of copyrighted materials” by users of its network, including “the use of one or more technology-based deterrents”. Every year, students register their computing devices through our network registration process. Part of the registration involves reading and agreeing to our Responsible Use policy. Network registration is enforced through a NAC appliance from Bradford networks. We respond promptly and regularly to DMCA notices. The College has a DMCA agent that promptly contacts the user that is in violation according to the DMCA notice. Repeated offenses result in loss of network access. The use of posters that regularly appear in commonly used public spaces, such as the Davis Family Library. This plan is reviewed periodically through the work of the security team. Note that Educause offers a selection of Role Model Institutions that have implemented a variety of similar compliance strategies. This entry was posted in LIS Staff Interest and tagged eNewsletter, law, p2p, security, Security on July 9, 2010 by Petar Mitrevski. The exhibit entitled “Dear James,” currently on view in the Davis Family Library Atrium exhibit cases, was curated by Emmie Donadio, Asst. Curator of the Middlebury College Art Museum, in collaboration with Special Collections, and mounted in the Library by Ms. Donadio and Special Collections Assistant Curator Danielle Rougeau. This entry was posted in LIS Staff Interest and tagged Areas and Workgroups, display, eNewsletter, exhibits, Library Spotlight on July 9, 2010 by Carrie Macfarlane.